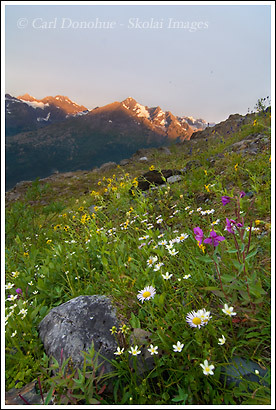 Wildflowers in the Chugach Mountains, Alaska. So this website stuff can really get a hold of ya. It’s a never-ending process, of updating and teaking and retweaking, and more updating, and then redoing again. And then learning that what you last did doesn’t work, and having to start all over. I need a break for a while. But I also find once I sink my teeth into it, I start to learn more, I start to get better at it, and it becomes easier. Then I take a break, and I forget it all, and have to start all over again. Life was easier as a simple guitar player. This week I’m finishing up some computer things here, then I head over to the park for some photos. I have no idea how productive it will be, as there really doesn’t seem to have been enough snow yet to make a winter trip, and fall is long gone. But I’m kinda keen to get going and do something other than photo editing and website work. I also want to try out my van on these roads before they get to bad. I have a 2wd van, and I hope it’ll be OK. I guess I won’t really know until I take-off. My plan is to head over towards Slana, on the northside of the park, and tool around there for a few days, and then go down to Chitina, and go in towards McCarthy for a a few days. I’ve got all my winter gear, some new insulated boots, and, of course, my 80gb iPod to listen to along the way. This photo is also from my Tebay Lakes trip in Wrangell St. Elias National Park this fall. I’ll be heading back there in 2008, and am keen to explore the area a bit more. The wildflowers in that part of the park are as good as I’ve seen anywhere. This entry was posted in Adventures, Alaska, Backpacking and Hiking, Landscapes, Web Stuff, Wrangell - St. Elias National Park on October 31, 2007 by Carl D.